* * * NOTES: Pat Patterson win the title in a fictional championship tournament..
* * * NOTES: Shawn Michaels was stripped of the championship for failing to defend it within 30 days..
* * * NOTES: Razor Ramon won a RAW battle royal. * * * NOTES: The championship was later held up when Jarrett's title defense against Bob Holly ended in controversy. * * * NOTES: Dean Douglas was awarded the title by forfeit due to Michaels being attacked outside a nightclub in Syracuse, NY on October 14, 1995. * * * NOTES: The title was held up when a title defense against Savio Vega ended in a no contest. The match aired April 15, 1996 on tape delay. * * * NOTES: Johnson forfeited the title after being attacked by Faarooq after winning an 11-man battle royal. * * * NOTES: Steve Austin handed the title to Rock. * * * NOTES: Vacated the title on October 9, 1998. * * * NOTES: Defeated X-Pac in a tournament final. * * * NOTES: On December 30, 1999, a title match between Chyna and Jericho ended in a double pinfall; as a result they were recognized as co-champions. WWE doesn't recognize this period as an official reign as the title is considered vacant. * * * NOTES: Chris Jericho and Chyna became co-champions. * * * NOTES: This was a chain match. * * * NOTES: Edge unified the WWE Intercontinental and WCW US championships. 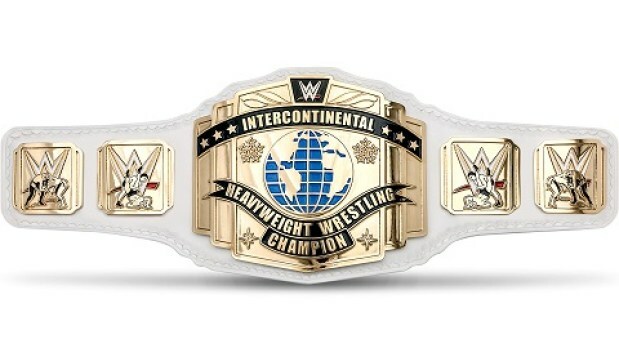 * * * NOTES: The WWE Intercontinental title became property of RAW. * * * NOTES: Ladder Match. * * * NOTES: Chris Benoit defected to SmackDown! with the Intercontinental title. * * * NOTES: Rob Van Dam brings the Intercontinental title back to RAW. * * * NOTES: The Intercontinental title was "retired" on October 20th, 2002. * * * NOTES: Christian won a Battle Royal for the vacant title. * * * NOTES: No-DQ/No Countout Match. * * * NOTES: Steel Cage Match. * * * NOTES: Edge was stripped due to injury. * * * NOTES: Chris Jericho won a Ladder Match. * * * NOTES: Carlito wins the title in his first match on RAW. * * * NOTES: Shelton Benjamin cheated!. * * * NOTES: Special Handicap Match. * * * NOTES: Triple Threat Match. * * * NOTES: Portrayed as a "FAN". * * * NOTES: Santino Marella and Beth Phoenix beat Kofi Kingston and Mickie James in a "Winner Take All" match to win the WWE Intercontinental title and WWE Women's title. * * * NOTES: William Regal won the title in less than a minute in front of his fellow countrymen!. * * * NOTES: C.M. Punk defeated William Regal in a No-DQ Match!. * * * NOTES: Rey Mysterio defeated JBL in 21-seconds and caused JBL to QUIT the company. * * * NOTES: This was a No Holds Barred match where Jericho threw Mysterio off his game by unmasking him during the match. * * * NOTES: Rey Mysterio defeated Chris Jericho to win the WWE Intercontinental title and retain his prized mask. * * * NOTES: Rey Mysterio was forced to drop the title after a violation of the WWE wellness (drug) policy. * * * NOTES: Drew McIntyre was stripped by SmackDown! General Manager Theodore Long on May 7th after McIntyre assaulted Matt Hardy and refused to obey Long's demands to stop. Long first suspended Drew, then stripped him of the title, and then ultimately fired him! * * * NOTES: Kofi Kingston defeated Christian in the finals of a 4-man tournament to win the vacant WWE Intercontinental title! However, Drew McIntyre showed up with a letter from Vince McMahon overruling Theodore Long's decisions from last week. Kingston's title victory was voided and the title returned to McIntyre! * * * NOTES: Drew McIntyre was reinstated as WWE Intercontinental champion by order of Vince McMahon. * * * NOTES: The Miz won a 19-man over-the-top-rope Battle Royale to win the vacant WWE Intercontinental championship. Participants included: Big E, Alberto Del Rio, Cesaro, R-Truth, Ryback, Curtis Axel, Zack Ryder, Titus O'Neil, Damien Sandow, Heath Slater, Diego, Sin Cara, Xavier Woods, The Great Khali, Kofi Kingston, Bo Dallas, Dolph Ziggler, The Miz, and WWE United States champion Sheamus. Wade Barrett was forced to vacate the title due to an injury. * * * NOTES: Daniel Bryan defeated WWE Intercontinental champion Bad News Barrett, Dolph Ziggler, Dean Ambrose, Stardust, Luke Harper, and R-Truth in a ladder match to win the title. * * * NOTES: Daniel Bryan vacated the title due to injury. * * * NOTES: Ryback defeated King Barrett, Sheamus, R-Truth, Dolph Ziggler, and Mark Henry in an Elimination Chamber match to win the vacant WWE Intercontinental title. * * * NOTES: Kevin Owens defeated WWE Intercontinental champion Dean Ambrose, Stardust, Tyler Breeze, and Dolph Ziggler in a fatal 5-way match to win the title. * * * NOTES: Zack Ryder defeated Dolph Ziggler, the Miz, Stardust, Sami Zayn, Sin Cara, and WWE Intercontinental champion Kevin Owens in a ladder match to win the title.